May | 2015 | What's Lorraine watching? May 2015 – What's Lorraine watching? Today we were treated to an early morning private tour of Edinburgh Castle. It was wonderful to be there without mobs of tourists clogging up every photo opportunity. We had an expert guide take us on a journey of the castle’s rich history and unforgettable characters. 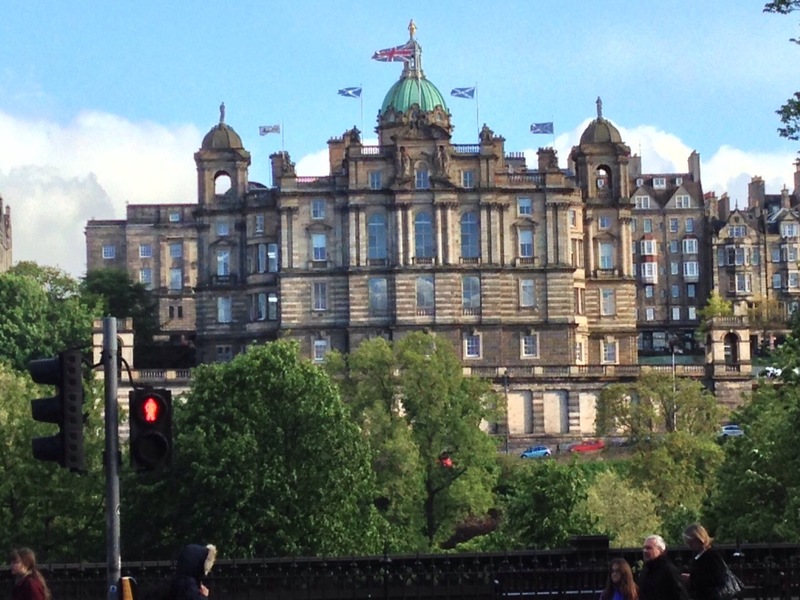 We then had a panoramic city tour of Edinburgh which featured the “new” and the “old” towns. The remainder of the day was at leisure to explore the city. 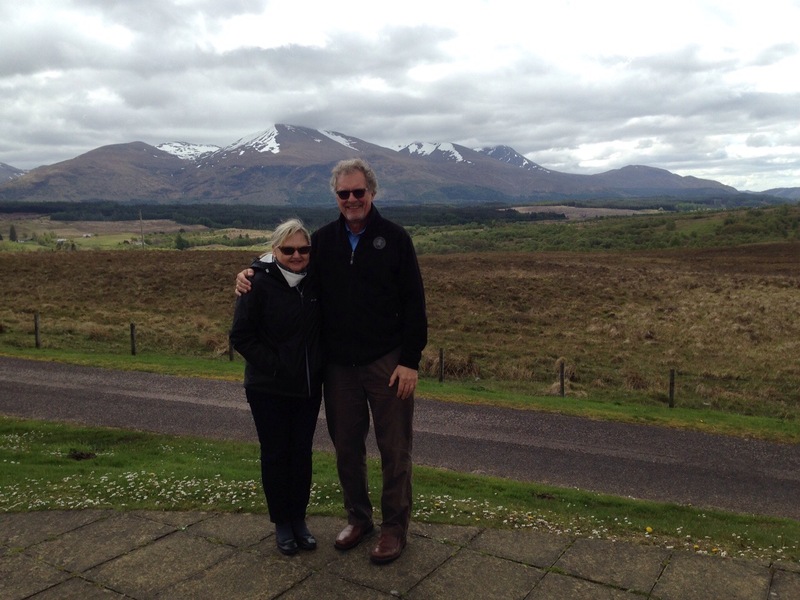 I was very fortunate to have the services of my own private guide, Catherine Thomson, lately returned to Edinburgh after a four-year stay in Toronto, where I had the great pleasure of getting to know her. 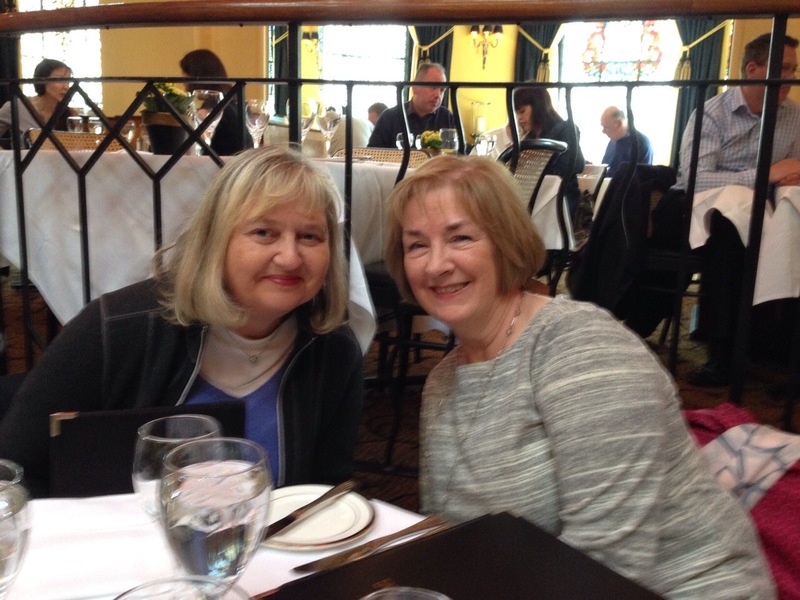 Catherine shared her love and expert knowledge of Scottish history with George and me as we lunched at the fabulous Dome restaurant, strolled the Royal Mile between Edinburgh Castle and the Palace, and then had a lovely stop for refreshments at the Cafe Royal pub in “new” town. This evening we attended the Spirit of Scotland Show, an evening of traditional entertainment and dinner at the Jam House (formerly BBC Studios). I had no idea that bagpipes made me cry and I was thrilled when the entire group got up and joined in a chorus of 500 Miles, my absolutely favourite Scottish song by the Proclaimers. The evening ended with a very emotional group version of Auld Lang Syne. It has been a wonderful week in Scotland with a great group of very diverse Canadians (and two lovely women from Turkey). It was sad to say goodbye to those in our group who were not going on to Ireland tomorrow with us. We will say goodbye to the lovely Roxburgh Hotel in Edinburgh as we go on to Dublin tomorrow morning where we will stay at the Grand Hotel, Malahide. We departed Perthshire for Edinburgh and the Kingdom of Fife. Our first stop was in the lovely medieval town of St. Andrews, home of Scotland’s oldest university and the capital of golf. There were many historic sites here of churches and the original cathedral all framed beautifully by the town’s location on the sea. After lunch we headed to Falkland to visit the village and the palace built by King James V in 1539. It became a favorite retreat of the Stuart dynasty including Mary Queen of Scots. Beautiful gardens, the oldest tennis court in Britain and very entertaining and knowledgeable guides including one who talked about an encounter with Prince William who stopped by to check out a piece of real estate he’d be inheriting some day. At the end of the day we checked into the Roxburgh Hotel in Edinburgh and after a short walk around our hotel district, we headed off for drinks and dinner at two spiffy spots, The Dome and Continis. Yesterday we headed to Perthshire via Culloden Moor, site of the 1746 Battle of Culloden. It was very moving to tour the site where the Jacobite uprisings (led by Bonnie Prince Charlie) ended in a tragic defeat for the Scottish highlanders in their effort to return a Stuart to the throne of Scotland. There was a very touching display and film in the visitor centre that gave a terrific sense of the battle between the Scots and the English. 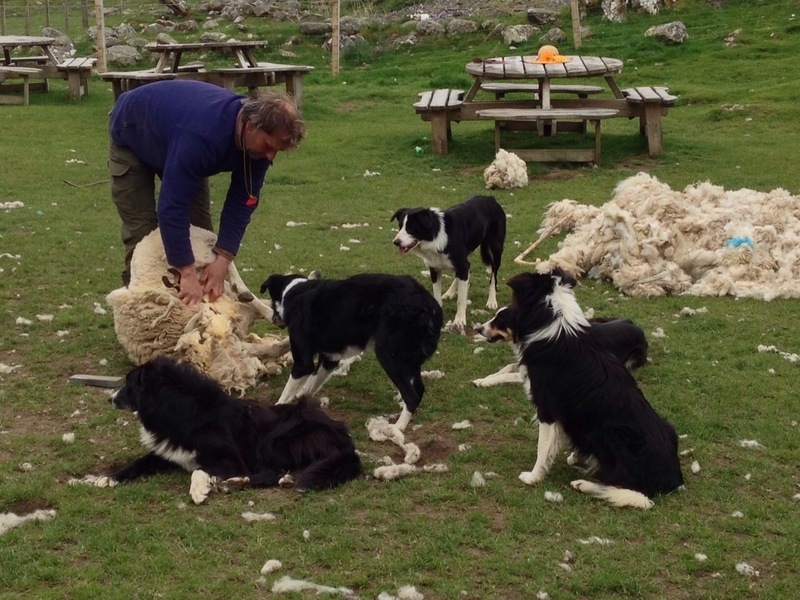 We then had a lovely lunch in the charming town of Pitlochry and then stopped at Kincraig for an impressive display of working sheepdogs. We then continued to Blair Atholl for a tour of the whisky distillery and the first of many wee drams we sampled yesterday. 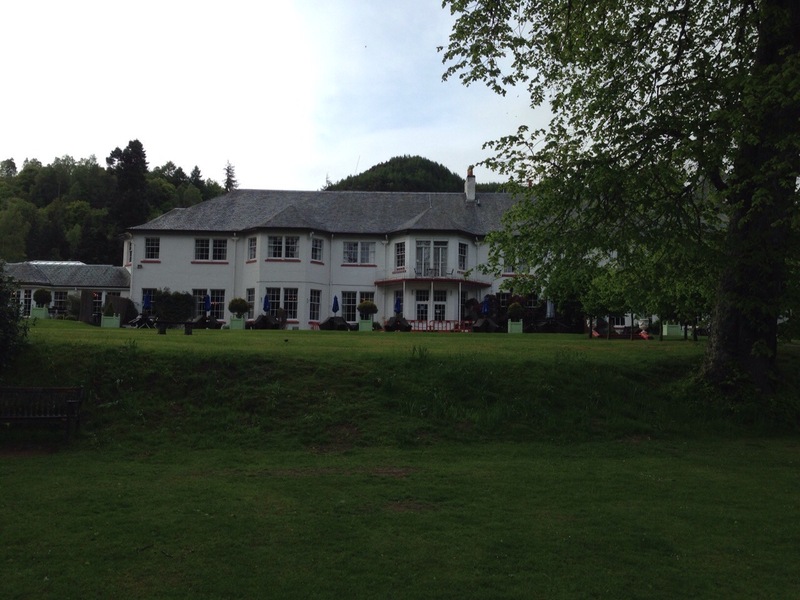 We stayed overnight in a charming hotel in Dunkeld on the river Tay where people were actually fly fishing for salmon. Absolutely gorgeous and a walking path along the river took us to the old cathedral of the town. Today was our day trip to the Isle of Skye, one of Scotland’s most beautiful islands. 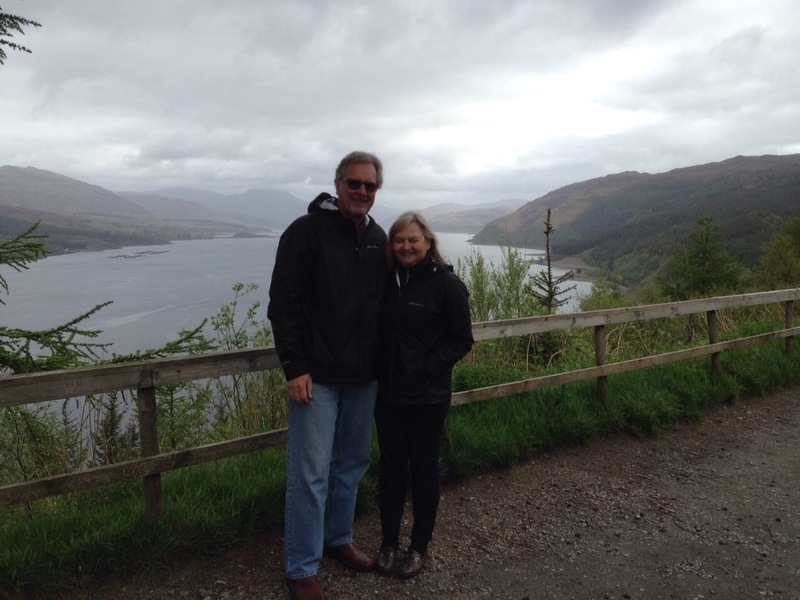 We enjoyed spectacular views of the West Coast Mountains, including the Five Sisters of Kintail and Glen Shiel. Arriving on the island over the Skye Bridge, our journey took us up the East coast, through pretty little hamlets and villages with quaint cottages, experiencing breathtaking views of the Red & Black Cullin Mountains. 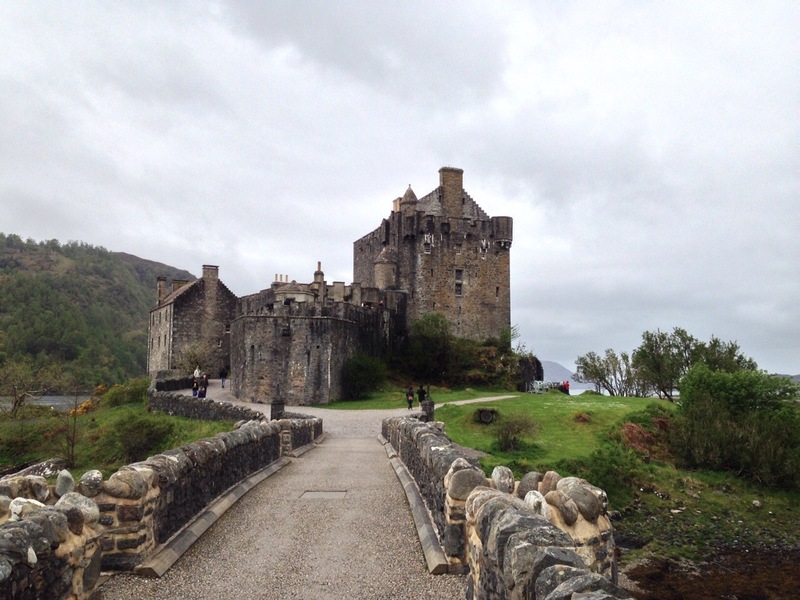 We visited Eilean Donan Castle which was a beautifully recreated medieval castle that had been destroyed by various sieges and lovingly rebuilt by the Macrae family. We spent a few hours in the city of Portree, a charming harbour town with excellent fish and chip shops. Our journey back to Inverness took us back by Loch Ness and although we were disappointed by the lack of mythical creatures, we were treated to a rainbow that spanned the entire width of the lake. I must admit that Monday was a bit of a blur. According to our itinerary we departed Glasgow for Inverness travelling along Scotland’s west coast and Loch Ness. Highlights of the day included Loch Lomond, dramatic Glencoe, a visit to Urquhart Castle and a cruise on Loch Ness in search of Nessie, the Loch Ness monster. We actually saw the sun at times today which was delightful, but sadly there were no sea serpents to be found. This day consisted of very long bus rides punctuated by food. As the bus movement seems to rock me to sleep, I missed a lot of beautiful Scottish countryside. I did wake up long enough to get a great view of Ben Nevis, which is the tallest peak in the UK. Gorgeously snow capped with a layer of cloud at the summit. We had a lovely dinner in our hotel in Inverness, Kingsmills Hotel, with a family from Saskatchewan. 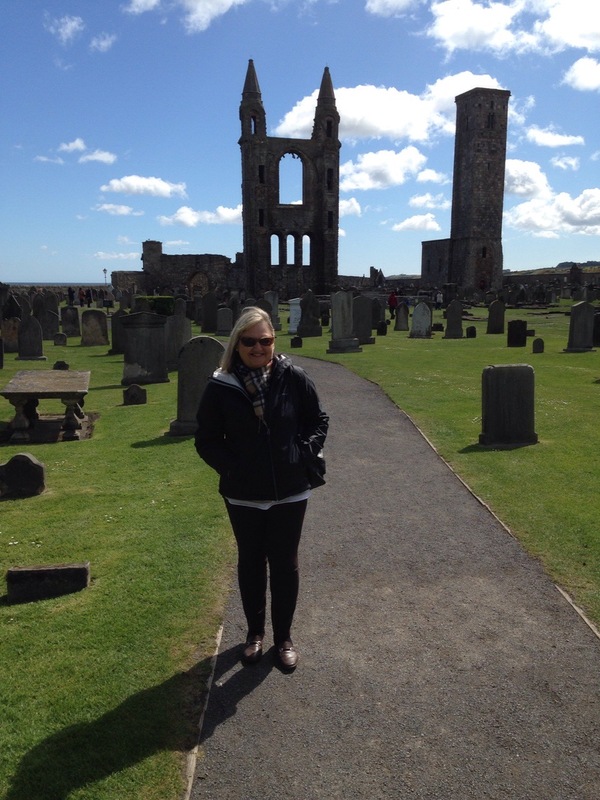 Royal Scottish tours is a Canadian company and almost all our travel mates are from all over Canada. There is a mother and daughter from Turkey travelling with us whose story I haven’t been able to find out yet. As I wrote this, there was a rerun of Law & Order UK on the telly. As I long ago vowed never to watch the US version, this is the closest I have come to being a Law & Order viewer. As one of my table mates at dinner is at school in Aberdeen doing a Master’s Degree, I asked her if she’d seen Outlander yet. Apparently, there was some nervousness re airing this show before the Scottish vote on independence, and the series only started airing this past spring. A lovely man from Brampton has reassured me that the show is being rerun this week because of holidays (Memorial Day in the U.S., and a bank holiday here in the UK). Thank goodness as I can’t wait to see how Claire and Jamie evade the dastardly Black Jack Randall. On discovering that we receive UK Netflix here, I tried to watch a British TV series called Residue but was unable to watch it because of a wonky Wifi connection. The series seemed to star the actor playing the nefarious Ramsay from Game of Thrones! Can’t wait for a decent Wifi connection to get back to this post apocalyptic series. Today we are off to the Isle of Skye! Typical Scottish sky this morning with grey clouds threatening rain. Time to go and put on the layers. After a very smooth flight to Glasgow, via Air Transat Club class, we were picked up at the airport and taken on a rather bleary eyed tour of Glasgow by our tour company, Royal Scottish tours. 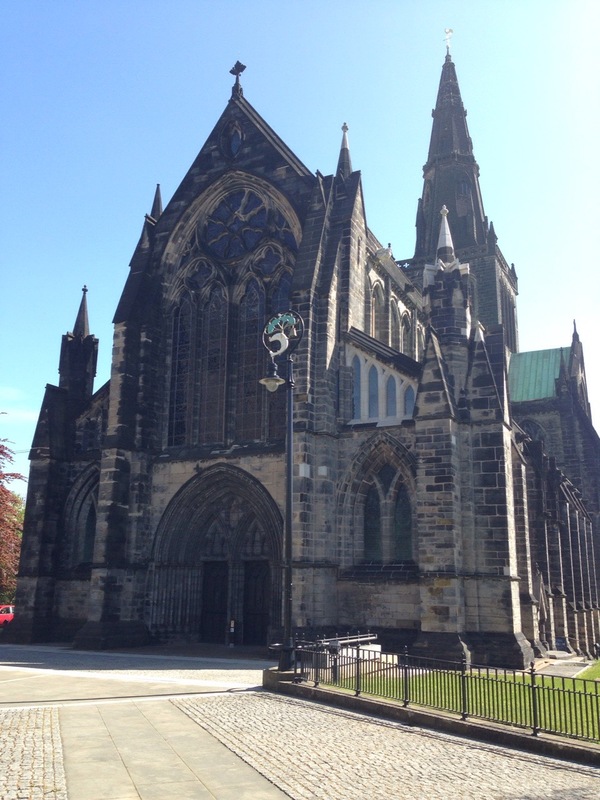 With a stop at the National Museum and the Glasgow Cathedral I must admit that the soothing bus motion and engine hum seemed to cause some sort of narcolepsy in me yesterday. Today we headed south of Glasgow to Ayrshire to visit Robert Burns country. Burns is revered in Scotland for his poetry and songs. The birthplace site in Alloway consists of a museum, beautiful monument and park, the original Burns family cottage, gorgeous walking paths, lovely church and an old bridge called Brig O’Doon which is celebrated in Burns’ epic poem Tam O’Shanter. From Alloway we continued south to Culzean Castle & Country Park. Donated to the National Trust in 1945 this beautiful estate is open to the public. Originally a medieval tower, over the years this home was rebuilt to house the Kennedy family. It is a grand country house and features a magnificent Oval Staircase and interiors designed by the architect Robert Adam. We discovered the glories of British Television last night as we channel surfed between the Eurovision Song Contest (perhaps one of the most bizarre TV shows I’ve ever scene as countries around the globe compete with original huge production numbers to win this coveted prize) and Britain’s Got Talent. In desperation we watched Kingsman, a crazy action espionage film starring Colin Firth and Michael Caine. Over the top mayhem but very enjoyable in its own way. Last week before travels begin! Just giving a little notice that from May 22-June 6, I will be travelling in Scotland and Ireland and so will likely not be watching much TV. Instead, I will try to share travel highlights which means finding Wifi and trying to remember how to add photos to the blog. Probably a great time for a hiatus as many series have come to an end and I am actually feeling a little TV fatigue. I’ve thought a bit about Netflix’s Grace and Frankie over the last week. I felt that despite the series’ sitcom format, it was actually at it’s most engaging when it veered from caricature into real moments of poignancy. I liked the elevator episode wherein the black adopted son of Frankie recalls his first glimmering that the two dads were gay. I also liked the frozen yogourt episode where Grace sees her potential future life flash before her eyes as she slips on the parlour floor. Lily Tomlin’s over-the-top performance as an aging hippy generally ruined the series for me, but I will probably hope-watch the second series to see if they can change the tone of the show, now that the big revelation moments have passed. Nashville – Cliffhanger ending: Juliette’s gone bonkers (again); Teddy’s been led off in handcuffs; Deacon’s surgery may not have gone well; Will has come out of the closet; Jeff is more dastardly than ever, etc. Oh the drama!!! Mad Men – last episode of this season airs Sunday; what will become of Don Draper, Betty, the kids, and everyone else? David Letterman – series finale starring Bill Murray and Bob Dylan airs Wednesday; my goodness what an epic 22-year run! can Stephen Colbert be far behind?!!! CBS Sunday Morning, 60 Minutes, Last Week Tonight with John Oliver, Game of Thrones, Bill Maher, Vice and, of course, just about any public affairs show on PBS such as Frontline, Nova, Independent Lens, etc. I believe Daily Show and Nightly Show are on hiatus this week. Streamed What We Do in the Shadows – this delightful NZ-made mockumentary is a hilarious film about 4 vampires sharing a flat together; it sends up all the usual vampire tropes and has very funny scenes with zombies and werewolves as well; who doesn’t love a great vampire/zombie/werewolf parody? Saw Mad Max Fury Road last night and loved it. Sensitive friends may want to bring earplugs (or perhaps give this one a miss). Tom Hardy gives his usual strong but sensitive performance, Charlize Theron is amazing and to my mind Nicholas Hoult (see him in Warm Bodies as the most lovable film zombie ever) steals the film as a war boy who is redeemed by the kindness of a good woman. Non stop action, amazing stunts, surprisingly little obvious CGI, great musical score. What an imagination director George Miller displays in this dystopian post-apocalyptic masterpiece! Next up at the movies is Pitch Perfect 2. Who doesn’t love a cappella singing competitions? I anxiously await the return of The Sing Off on NBC for its 5th season (hosted by Nick Lachey, former member of boy band 98 Degrees and ex-husband of Jessica Simpson). Enjoy this amazingly changeable spring weather and I will send my next updates from Scotland and Ireland! On a friend’s recommendation, I did watch the French crime series Witnesses. Six hours in length with English subtitles, this little gem of a series is totally addictive. Set in a coastal town in Normandy, France, the action starts when recently buried bodies are unearthed and placed in model homes. If you liked Spiral, another great French crime series available on Netflix, you will probably love this show. Another great French suspense series available on Netflix that I enjoyed was The Returned (or Les Revenants). Very eerie in tone, people who have been long dead, start returning to a small French Alpine town. The American adaptation of this show is currently being aired on A&E, for those who have trouble with subtitles, but the French original version is a little more subtle. The series has been renewed for a second season, so watch for it. Many American series are swiftly moving to their finales (The Good Wife, Gotham, The Flash, Forever, Nashville,The Blacklist, Elementary, Grimm, Mad Men, etc.) so you may want to set your recording devices. Many of my favourites are still going strong: Last Week Tonight with John Oliver, Call the Midwife, Game of Thrones Silicon Valley, Veep, Nurse Jackie, Salem, Outlander, etc. This past week, I actually got out to the movies to see Far from the Madding Crowd. Loved it! Carey Mulligan is perfect in the lead role of Bathsheba Everdene and all the men in her life are perfectly cast, especially the Belgian actor Matthias Schoenaerts as Gabriel Oak. Gorgeous scenery, costumes and music which held my attention for 2 hours. No snoozing!! In the meantime, enjoy this beautiful weather that we have just in time for Mother’s Day. Another wonderful sitcom now airing on Netflix is the show Episodes. This series, which has just completed its fourth season on HBO Canada, originates with Showtime in the US. It stars two Brits as writers who bring their successful comedy series from the UK to adapt it for American audiences. Very funny! It stars Matt LeBlanc, playing himself as a has-been actor who played Joey on Friends, who is forced upon the writers as the star of the American series. The series is a behind the scenes satirical look at Hollywood and the TV industry. LeBlanc is actually very funny in this as he lampoons himself for his narcissism and unscrupulous drive to survive in an industry that is completely fuelled by ruthless ego and ambition. For those of you who haven’t yet discovered Bloodlines on Netflix, this new original Netflix mystery series is set in Florida and tells the story of a family whose prodigal son reappears after a long absence. Very noir and incredibly suspenseful, I dare you not to binge watch its 13 episodes. At the risk of sounding fanatical, I also recommend Daredevil. It is a Netflix original series that also debuted this spring in all its 13 episodes. It is a superhero story told in non CGI style. Charlie Cox stars as Matt Murdock, a lawyer blinded in a chemical accident as a child. Possessing absolutely no super powers, Murdock wrestles with his principles and the morality of drawing the line between right and wrong. He is constantly struggling with following the strictures of the law or taking it into his own hands as a vigilante. Featuring remarkable fight scenes, this series is great viewing, even for people who wouldn’t ordinarily watch any kind of superhero story. Go on, get out of your comfort level with cosy British nostalgia series, and give this exhilarating series a try. Also on Netflix, you might enjoy Love is All you need, a Danish film starring Pierce Brosnan. It tells the story of a family wedding that takes place in Italy. Absolutely wonderful performances and a surprisingly charming film. There are many more British series available on Netflix and I encouraged you to seek them out. On HBO Canada this week a BBC miniseries called The Casual Vacancy (adapted from a JK Rowling novel for adults) aired in three parts. It deals with the aftermath of a town councillor’s death in a seemingly absolutely charming English village which results in his seat having to be filled by one of the villagers. It stars Michael Gambon and Julia Mackenzie (who you will recognize as Miss Marple) as two of the villagers. This series is far from cosy and is a portrait of class conflict in a small British town. If you are on Rogers and have On Demand features for TMN you will be able to find this show. Also you can probably find it on one of the many free streaming sites. This week, I’ll be watching all my favourites: SNL with Scarlett Johansson hosting, CBS Sunday Morning, Last Week Tonight with John Oliver, The Good Wife, Call the Midwife, Wolf Hall, Game of Thrones, Silicon Valley, Veep, Nurse Jackie, Salem, Outlander, Gotham, The Night Shift, The Flash, Forever, Chicago Fire, Arrow, Nashville, The Middle, Modern Family, Elementary, Father Brown, The Blacklist, Grimm, Bill Maher, and Vice. Pheww! That’s quite a week coming up. Enjoy the spring blossoms this week as it looks like everything is finally bursting into bloom.